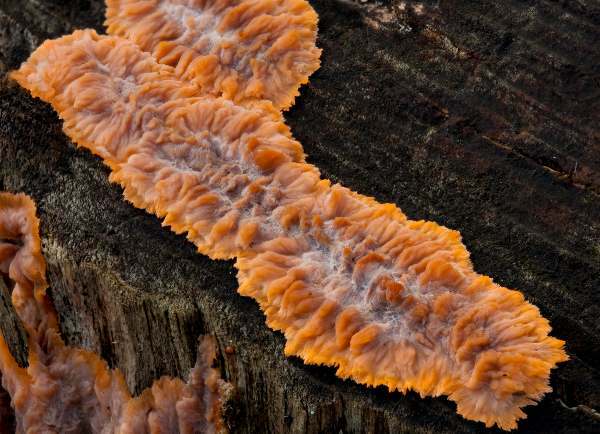 A wood-rotting crust fungus of fallen trunks and branches from deciduous hardwoods and occasionally conifers, this attractive species produces its spores on the wrinkled outer surface. Wrinkled Crust is very common in Britain and Ireland. The specimens shown above are young and pale; with age the central part of the fruitbody usually turns more intensely orange. 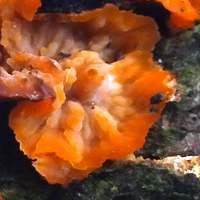 The Wrinkled Crust fungus is found throughout Britain and Ireland as well as in many parts of mainland Europe and North America. 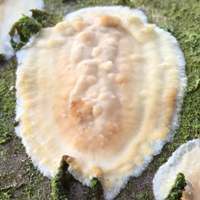 In 1821, when Elias Magnus Fries described this corticioid species he gave it the binomial scientific name Phlebia radiata - the name by which this crust fungus is still known today. 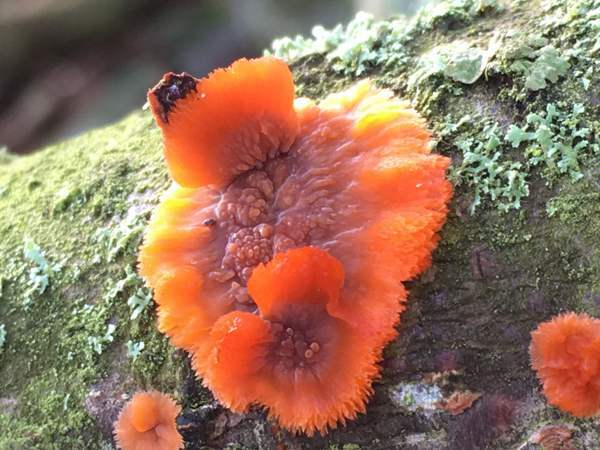 Synonyms of Phlebia radiata include Auricularia aurantiaca Sowerby, Merulius merismoides Fr., and Phlebia aurantiaca (Sowerby) J. Schröt. Phlebia radiata is the type species of its genus. Phlebia, the genus name, comes from the Greek from Greek phleps, phleb- meaning or pertaining to veins. The specific epithet radiata is a reference to the ray-like wrinkles or folds which spread out from the centre. 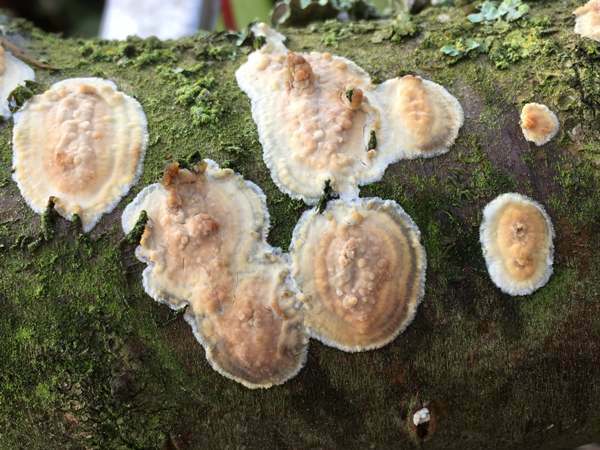 This is a resupinate fungus (most parts are firmly attached to the substrate but some edges may be free); it grows as circular crusts up to typically 10cm across and 1-3mm thick, but many fruitbodies can merge to form much larger patches. When young, the fruitbodies usually have pink fertile (outer) surfaces, much paler at the margin. 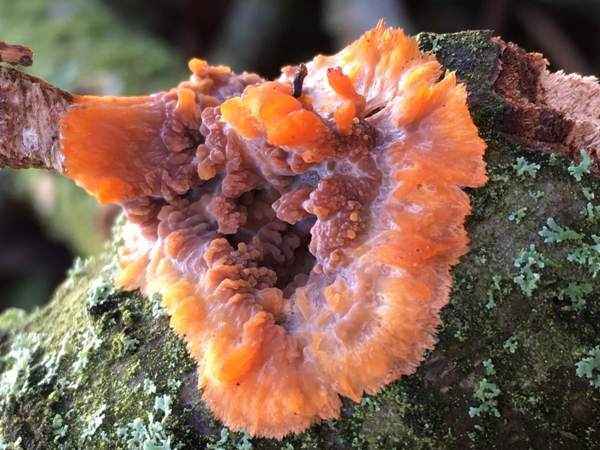 As they mature, the fruitbodies become darker, usually turning bright orange but sometimes brown or even with a violaceous tinge; often paler and more fibrous (even appearing somewhat hairy) at the margin. The flesh is soft and jelly like. There are no pores on the fertile surface, which is irregularly lumpy with wrinkles radiating from the centre like veins. The basidia are four spored and clamp connections are present. Sparse cystidia in the fertile surface are cylindrical or slightly clavata, 10µm wide and up to 100µm long. Saprobic on dead broadleaf trunks and fallen branches, particularly of oaks; occasionally also on dead conifer timber. Most often seen in autumn and winter. This fungus is generally regarded as inedible. John Eriksson, Kurt Hjortstam and Leif Ryvarden (1981) The Corticiaceae of North Europe, Volume 6; Fungiflora, Oslo, Norway. Taxonomic history and synonym information on these pages is drawn from many sources but in particular from the British Mycological Society's GB Checklist of Fungi and (for basidiomycetes) from Kew's Checklist of the British & Irish Basidiomycota. This page includes pictures kindly contributed by Simon Harding and David Kelly.